Food & Water Watch is one of the most vile special interests out there. It also offers a teaching moment as to how the gentry class launders money to lobby. There are few more contemptible specials than Food & Water Watch. Run by the haughty Wenonah Hauter, who’s made a pile of money milking the guilty-ridden rich to advance essentially socialist causes, this group engages in some of the grubbiest tactics imaginable. It pretends to be grass-roots but is anything but. It gets most of its money from donor-advised funds that allow big-money special interests to avoid disclosure. It’s nothing less than money-laundering to hide lobbying by private foundations who aren’t legally allowed to do it. I’ve detailed this abuse many times here on this blog, but I don’t believe there’s any worse example than what happens with Food & Water Watch. It operates on a budget of roughly $17 million per year, according to the 990 return it filed with the IRS in 2016. It pays over $10 million out in payroll plus almost $2 million for contractors such as direct mailing companies and the Josh Fox Svengali of Phony Environmental Causes, David Fenton, who got over $650K. But, what’s interesting is who provides the money. Add those numbers and you get $13 million or 78% of the Food & Water Watch budget that comes from merely four donors. Who are they and what are their interests? Well, we can’t know precisely. But, we know from past research how this odious organization works. It raises most of its money from what are known as donor-advised funds. These are pass-through entities that provide an additional degree of separation between donor and recipient. A donor who gives through them can designate where his or her money goes without having their name even remotely connected with the particular cause to which it goes. It’s Money Laundering 101. These donations, which accounted for 80% of Food & Water Watch revenue in 2016 don’t exactly match its 990 return because organizations have different fiscal years but we can match up the $6,100,00 and account for what is clearly the bulk of Food & Water Watch donations for this general period of time. We learn the $6,100,000 donation is from the Greater Kansas City Community Foundation, which has reinvented itself as what is essentially a giant $3 billion organization that includes a collection of donor-advised funds. Its 990 Schedule B shows one donor who gave over $28 million and several others who gave over $10 million. Who are they? It’s almost impossible to decipher with so many donors, most of whom are individuals at this level. We get some clues, though. 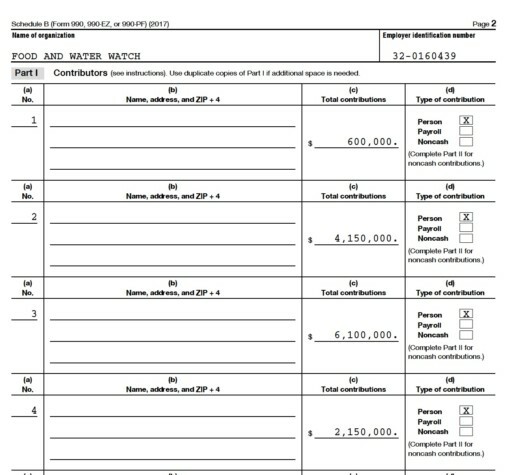 One of those clues is the Schmidt Family Foundation, which gives money to the Greater Kansas City Community Foundation and also gave $320,000 directly to Food & Water Watch in 2016. This is Schmidt as in Eric Schmidt, the Google/Alphabet guy. Schmidt and his wife Wendy throw tens of millions of dollars at the NRDC gang (including the Catskill Mountainkeeper subsidiary), EarthJustice, Earthworks, Climate Central, Climate Solutions, the Delaware PovertyKeeper, the Frack Action Fund, FracTracker Alliance, Grist Magazine, Mother Jones, the Mountain watershed Association, New York PIRG, PSEHE (Tony Ingraffea’s group), Post Carbon Institute, Public Citizen, Sierra Club, the Solutions Project, Southwest Pennsylvania Environmental Health Clinic, the Sustainable Markets Foundation ($855,000 for the this Rockefeller project directed by Fractivist Rasputin Jay Halfon), the Trust for Conservation Innovation (now Multiplier) and the Union of Concerned Scientists. There are several others but the picture is clear. Every single one of these entities is a fractivist outfit with a special interest mission. It’s often to promote corporatist renewable energy schemes such as the Ivanpah solar boondoggle Google undertook with taxpayer money. In other cases, it’s buying off the natural opposition to what Google does in selling your name and privacy. The most important mission though is to buy exclusiveness and elite status. That comes through in numerous grants for projects on Nantucket where the median household income is 60% above the U.DS. and the median home price is $895,000. These are typical of the people who fund Food & Water Watch. They’re not grass roots but, rather, huge elite tree trunks. And, they funnel they’re money to groups such as Food & Water Watch in multiple ways. Schmidt, for example, gives to the Silicon Valley Community Foundation, too. Moreover, the Sustainable Markets Foundation, which Schmidt supports, also funds Food & Water Watch as does the Park Foundation. This is how the money is laundered and spread around to be directed to Food & Water Watch and other organizations, much of it being done behind the walls of donor-advised funds. One can also see how this works in one of Food & Water Watch’s own grants. It only gave seven in 2016, mostly to what appear to be closely related entities with whom they are engaged on the ground in various places around the country. One of those grants was a $42,000 grant to the Catskill Mountainkeeper for “fracking issues.” What’s that all about? Why would the Mountainkeeper, which has access to both Schmidt and Rockefeller cash and a state solar slush fund, need money from a fellow fractivist group on the ground? What kind of work is Mountainkeeper doing for Food & Water Watch? And, what exactly does “fracking issues” mean? Something doesn’t ring right about that, bit it illustrates the convoluted nature of fractivist funding. The one thing we do know, though, is that Food & Water Watch is as fake as it gets. It’s nothing but a bunch of wealthy elitists pulling a fast one and engaging in the worst sort of lobbying under the cover of a phony public interest group. 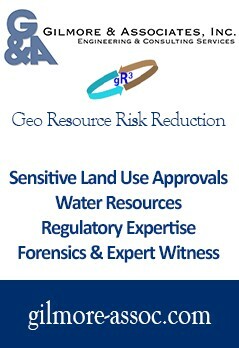 environment and health and safety.. When will you publically print your tax returns and show your donors? Although, I am opposed to much government over regulation, this seems to be an area where there is much too little government over sight. These sort of things need to be transparent to the public. But it is another indication of how the super wealthy are able to game the system. An indication of how little taxes the “Green New Deal” will get from the super rich, who will find a way to avoid the proposed high tax rate, while still using their money to subvert fair competition. If the new breed of socialist firebrands want to fix things, work on this money laundering problem. A special shout out to Trespassing Vera and her video Blog Site for providing evidence against her friends via video. With friends like Vera I bet Huston, Stevens, and Ray wish they had gas wells for their upcoming legal fees. Your honor…. I’m indigent but I am sorry I pretended to be a lawyer…. can I get in trouble for telling a town board I am a scientist?